Soil is the foundation of any farming system. Having healthy soil is essential for growing healthy crops and feeding a healthy diet to livestock and people. This holds true for all types of farming. However, because of the reliance on holistic management and the lack of availability of "band-aid" fixes, taking care of the soil is especially important for organic farming. Many of the basic principles of soil management have been understood by generations of farmers, who have observed the importance of "feeding the soil" with manure and crop residues in order to maintain productive fields. In an effort to better explain the complexities of soil, scientists often categorize soil properties as either physical, chemical, or biological. Anyone who has tried to pound a fence post into compacted soil has experienced soil physical properties first-hand. Besides compaction, physical properties include porosity, water-holding capacity, and aggregate stability (the ability of individual "crumbs" of soil to hold together in a heavy rain storm). Chemical properties are perhaps the most familiar to farmers, since they include many properties measured by standard soil tests: pH, macronutrient and micronutrient status, and cation-exchange capacity (CEC). Soil not only is composed of minerals, decayed organic matter, air and water; it is also teeming with microorganisms such as bacteria and fungi. These organisms, along with others such as nematodes, collembola, mites, ants, beetles, and earthworms—sometimes referred to as "soil livestock"—play essential roles in cycling nutrients, thus supporting plant and animal life. The biological properties of soil are a relatively new focus of soil science, and include factors such as biological activity, biological diversity, and particulate or "active" organic matter—the fraction of the organic matter available for organisms to decompose. As you might imagine, these biological, chemical, and physical properties are interdependent; it is nearly impossible to change one of them without affecting the others. For example, manure might be applied to enhance soil fertility. Its application will also have effects on biological activity as microorganisms are stimulated by the addition of a food source. The biological activity, in turn, may affect the aggregate stability of the soil because compounds produced by microorganisms help to bind soil particles together. 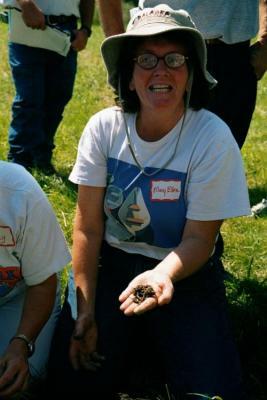 Vermont farmer Mary Ellen Franklin shows earthworms, indicators of healthy soils. Photo credit: Lisa McCrory, Earthwise Farm and Forest. Not everyone has the luxury of farming on the perfect, loamy, stone-free soil. But you can do things to improve the soil you have. A good start is to learn more about your soil. Find out what type of soils you have by contacting your local Natural Resource Conservation Service office. There are thousands of unique soils in the United States, each referred to as a soil series with distinct characteristics such as drainage class, depth to bedrock, and texture. Another important step is to have your soil tested for macro- and micronutrients, pH, CEC, and heavy metals so that you know its nutrient status. Most land grant universities and many private labs offer soil testing services. Some properties of your soil cannot be changed; for example, if you have a sandy soil, there is no rational way to change it into a silt loam. These inherent properties depend on the parent materials, geography and soil-forming processes and are stable over time. For example, soils formed from limestone parent material tend to contain more calcium and generally have an inherently high pH. Other soil properties are dynamic and can be changed in a relatively short period of time by human management practices. These include characteristics like soil organic matter, soil biological activity, nutrient availability, and soil tilth. For example, you might be able to enhance the water and nutrient holding capacity of your sandy soil by building soil organic matter. Manipulating these dynamic properties to enhance the expression of inherent properties is the focus of soil management efforts. How Do Management Practices Influence Soil? Some important goals of soil management include building and maintaining soil organic matter and biodiversity, preventing erosion, enhancing aeration, minimizing compaction, and providing sufficient nutrition to plants. Because soils differ so much by region and even by field, it isn't helpful to give blanket recommendations for specific problems. However, there are some general strategies that, coupled with a solid understanding of soil function, can improve soil health. Tillage can be important for preparing a seedbed and controlling weeds. However, it is generally accepted that excessive tillage damages soil structure, degrades organic matter, and increases the risk of erosion. In addition to the soil health benefits, adopting reduced tillage practices may reduce fuel costs. Organic soil amendments, such as composts, manures, and cover crops, help to build organic matter and maintain soil fertility. The addition of organic matter from a diversity of sources, along with leaving crop residue on the field, enhances soil biological activity and biodiversity. Organic materials, like manures and compost, also contain nutrients such as nitrogen and phosphorus, so their application rates must be based on soil test recommendations to prevent their over-application. Protection of the soil surface, shields it from the damaging effects of rain, wind, and temperature extremes. Whenever possible, leave a crop residue on the soil, apply mulch, or use cover crops extensively. Crop rotation is important from the perspective of pest management, but can also benefit soil health. Perennial forage crops, such as hay and pasture, help to build soil organic matter and improve the physical structure of soil. Each type of crop provides a different environment and encourages different microorganisms in the soil. As a result, crop rotation will encourage biodiversity and reduce the buildup of pathogens and pests. Prevent compaction by reducing the number of passes made by heavy equipment across a field. It is also important to avoid operating equipment on soils that are too wet, since that is a major cause of soil compaction. Compacted soils are more susceptible to erosion. Soils can be protected from erosion by keeping them covered and building their resistance to eroding forces. Soils with excellent tilth from proper levels of organic matter have good structure and are more resistant to compaction and erosion. Nutrient management refers to the practice of matching nutrient availability in the soil with crop needs to improve crop productivity and reduce environmental pollution. Nitrogen and phosphorus are both nutrients needed in relatively large amounts in agriculture, but can also be sources of agricultural pollution if excessive amounts are present. Nitrogen and phosphorus can pollute drinking water and lead to algae blooms in surface waters, respectively. Maintaining soil biodiversity is a preventive measure to produce a healthy soil and reduce pest problems. A biodiverse soil has natural checks and balances built into the system that can help prevent outbreaks of some pests. Each crop has specific microbes, insects, and weeds associated with it. To have biodiversity below ground, you must promote it above ground. Rotations, cover crops, biological- or ecological islands of plants chosen to attract specific beneficial insects above ground, and additions of organic materials such as manures, composts, and cover crops all promote a biodiverse soil system. Plants grown in biodiverse soils have fewer diseases and are less susceptible to insect and pests (Magdoff and Van Es, 2009). Maintaining soil fertility is important for growing healthy crops. The availability of many nutrients is dependent on pH, so make sure that your soil pH is at a level that is appropriate for the crops you are growing. It is important to test your soil and obtain nutrient recommendations from a testing lab in your area, since recommendations vary by region. Growing legume cover crops and rotating corn, soybeans, and small grains with grass legume forage crops can produce all of the nitrogen needed for crops. For those dairy farms purchasing concentrate feed for the cows, keep in mind that you are importing nutrients at the same time, lessening the need to use fertilizers. For vegetable, fruit, and flower farms, imported materials such as manures or composts made of manures or other organic materials can supply a lot of nutrient needs and at the same time help build up soil organic matter levels. If soil testing indicates that specific nutrients are below optimal levels, using organically approved sources can be more complicated than purchasing standard blended fertilizers. Find out what is available in your local area and consult with your local extension agent, agricultural service provider, or other experienced organic farmers to figure out the most effective approach. Magdoff, F. and H. Van Es. 2009. Building soils for better crops. Sustainable Agriculture Research and Education (SARE) publication. Third Edition. Available online at: http://www.sare.org/Learning-Center/Books/Building-Soils-for-Better-Crops-3rd-Edition (verified 12 July 2012). Clark, A. (ed). 2003. A whole-farm approach to managing pests [Online]. The Sustainable Agriculture Network Bulletin. Available at: http://sare.org/publications/farmpest.htm (verified 21 March 2010). Dufour, R. 2000. Farmscaping to enhance biological control: pest management systems guide [Online]. ATTRA Publication #CT065. Available at: http://attra.ncat.org/attra-pub/farmscape.html (verified 21 March 2010). Natural Resources Conservation Service [Online]. United States Department of Agriculture. Available at: http://www.nrcs.usda.gov/ (verified 21 March 2010).